[sounder] The news watch never stops... This WINS... You give us 22 minutes, we'll give you the world. Hear how WINS sounds in 1978, plus an interview with the WINS executive editor. "A teenage woman hijacker releases five people out of 89 aboard a TWA jet in southern Illinois..."
If Hildy Johnson -- the fictional reporter from the classic movie The Front Page -- had been in radio, he probably would have worked for WINS: "'CBS is the New York Times of newsradio," observes WINS news director Paul Jeffers. "We're the Daily News." The WINS broadcast hour, which is sub-divided into 20-minute slots. WINS executive editor Fred Walters admits the format might be considered less flashy than WCBS, but by design. "Generally, the difference in philosophy between the Westinghouse all news operations and CBS is that we tend to be much harder in the news," says Walters. "At CBS, I think you'll find much softer news, with many more features and more of a use of personalities on the air. We tend not to play personality radio, or go into the soft stuff as much as they do." "We're recognized as being faster paced -- giving a harder news diet -- than any of our competitors would: Shorter bites of news, probably, except for major stories. 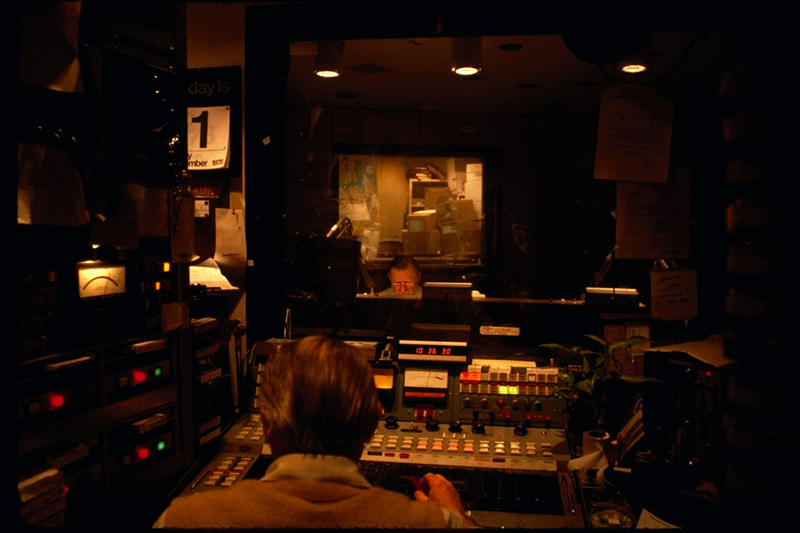 I suppose what the listener is going to hear in an hour will be predominantly current news, and not as many features as he would hear on another all-news station." 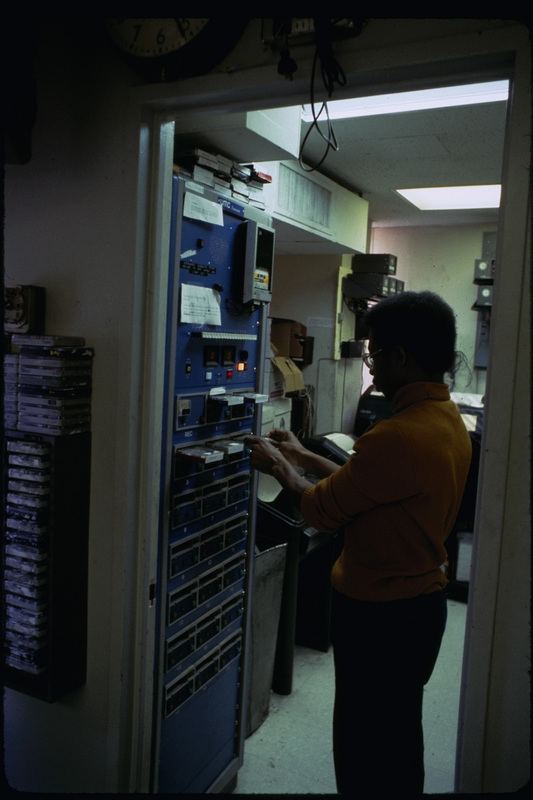 The WINS AP Radio "feed machine," affectionately nicknamed 'R2D2'. 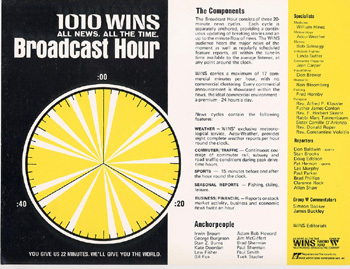 WINS aims for high "cume" responses (listeners tuning in more frequently for shorter times), as opposed to WCBS's striving for longer listening. (For an interesting comparison, see the WCBS Profile.) As part of its strategy, WINS uses 20- and 30-minute schedules, depending on the time of day. By comparison, competitor WCBS works on an hour-long format, broken into two half-hour segments. "There's I suppose, a division of opinion in all news radio over whether you should program for long listening, or more frequent listening," explains Walters. "I would guess at WINS, we go for the frequency, so we would look for a faster turnover of news and more of a sense of immediacy in updating stories. So that you might listen to use for a certain period of time, go away for several hours, and come back for a kind of 'quick peek at the news,' so to speak." "The other theory about all-news programming is that you avoid repetition and put on a lot of features, and you try to get people to listen for long periods of time," says Walters, in a veiled reference to competitor WCBS. "I don't know that's really practical because when you start doing that, you really cease to perform what I think is reality a more function of all news, and that is giving the listener "news the minute you want it. If you have a lot of soft stuff, and a lot of features, and things like that, you're really not going to give them news the minute they want it." "I suppose for convenience sake you would say that we are on a 20-minute cycle," Walters says. "In morning drive, and on a 40-minute cycle at other time periods. But cycles are really hard to define: The listener doesn't listen in cycles. 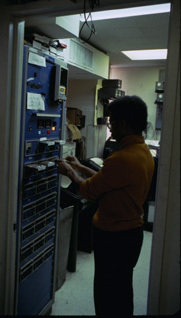 The listener happens to tune in at any point on the clock, to hear something, and that is that listener's personal cycle. And programming all-news, that's what you address yourself to." So, Really... The World in 22 Minutes? Does WINS really give the world in 22 minutes? Here's the inside scoop from Walters, WINS 1010's Executive Editor: "It takes longer, really. It would probably take closer to 40 minutes," admits Walters. "Or at least 30 minutes. Again, it depends on the time period, because we program differently for different periods of the day. The 22 minutes I don't think would ever really handle it. I think you'd have to at least give it 30." "You never know about all-news listeners," reflects Walters. "There are people who will listen for hours at a time. There are those who will listen for very short bites. Maybe they get bored after two or three minutes. That's very much an individual preference." 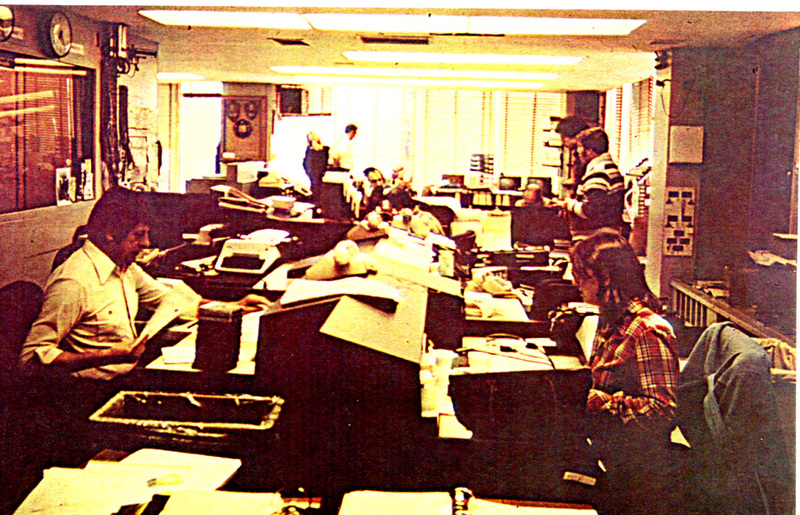 WINS Picture Gallery - Photographs and brochures from WINS, circa Fall 1978. WINS News Schedules - The schedule block, and an example of an internal schedule from an evening news hour. WINS Datasheet - Station stats on staffing, wires, cart machines, and much more! WCBS Profile - A profile of the other all-news station in town. 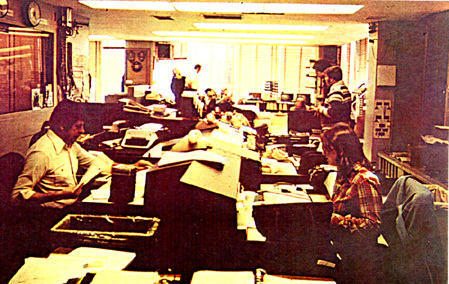 Associated Press Day Book - An example of the "daybook" feed from the AP, used by WINS assignment editors. WINS and other NYC stations in the 1964 New York City Blackout - A recreation from Broadcast Engineering magazine, by radio historian Jeff Miller. Today's WINS - The 1010 WINS web site.